Disc for play on a Super Audio Disc Player only! 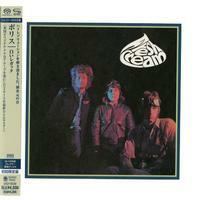 The debut studio album by Cream was originally released as both a mono and stereo album in December 1966 in the U.K. and January 1967 in the U.S.
Label of the disc is printed with a special green ink called 'Onsho Shiyou,' which minimizes diffuse reflection. Carefully selected master audio is used, from existing DSD files to newly converted from analog tapes. SHM-SACD format is fully compatible with standard SACD players but it does not play on standard CD players. SHM-SACD delivers unbelievably high-quality sound. Japanese import.